SAP SCRIPT is client dependent because it a old form technique and it is stored in a client dependent table. So after the script development it has to copied to another client where it can be really used. 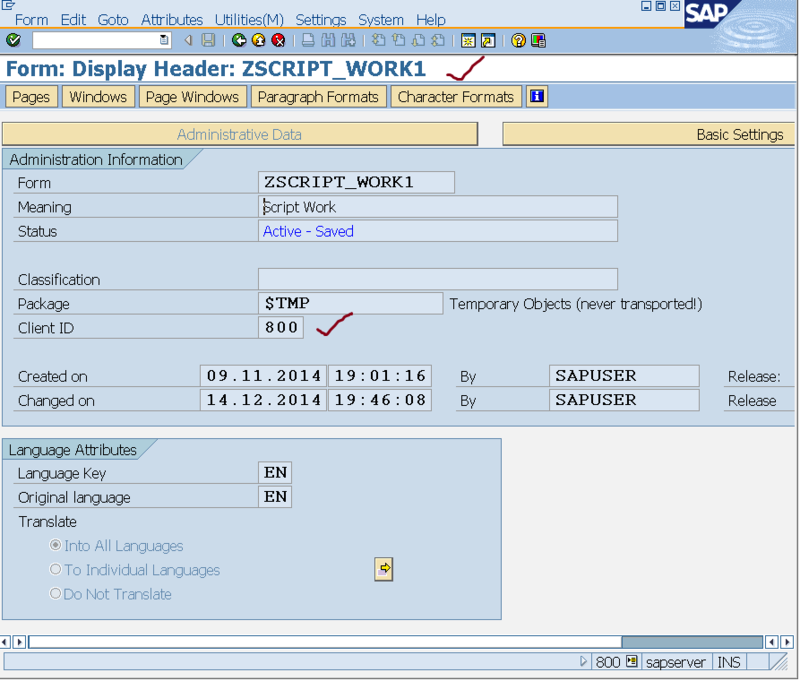 The below post demonstrates the possible ways available in SAP to do a sap script client copy. Step1. So here we logged in two clients 800 and 001 of the same systems. The SCC4 tcode shows all the clients in the system. Lets copy the form available in client 800 to the target client 001. Step2. The script: ZSCRIPT_WORK1 is created in the client 800 and it is not available in the client 001 as the script is client dependent. Step3. Do the print test of the form as shown. Step4. So we have the form output. Step5. Out target client is 001 and we need the script to be copied form client 800 to 001. So now in the target client 001, from the home screen of Tcode- SE71, from the menu Utilities-> Select Copy from client. Step6. Form name is the source form name to be copied, client is the source client from where the form will be copied. Target form is the form name to be created in the target client 001. If you check the flow trace check box then after F8, log will be shown. Press F8 to copy. Step7. Usually if the Flow Trace check box is not selected then no message is shown. Now provide the form name and click on display in the client 001. Step8. Do a print test in the client 001. Step9. So here we have the same output in the new client 001. Step10. There is also another way to copy the form from a source client to the target client. SAP provides a standard program : RSTXFCPY . Open tcode- SE38 in the target client 001 and execute it. Step11. Mention the necessary things and execute it. Step12. Will prompt to save in the package. Choose your required package. For this demo we can save it in local object. Step13. Once copied successfully the below log generated. Go back. Step14. Open the form in SE71 and do a print test. Step15. So here we have the output of the copied form in the target client.